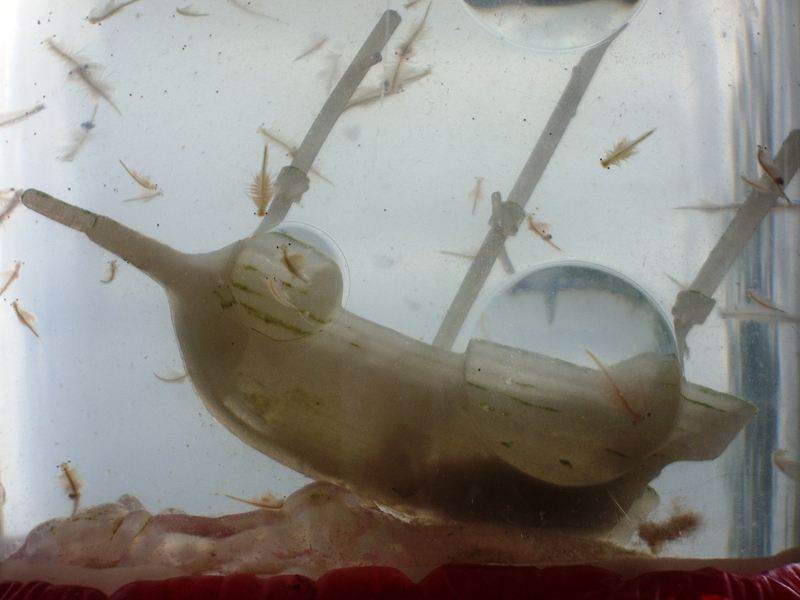 Artemisa fransiscana, AKA Sea Monkeys. Image from Utah Division of Wildlife Resources. If you can get past the smell of sulfur and brine, a swim in the Great Salt Lake is a swim with some of the planet’s toughest creatures, brine shrimp. The lake is other worldly and shallow, surrounded by white salt flats that breed mirages like the lake breeds gnats. Venture out far enough, to a place where the water is at least waist deep, you’ll find it impossible to sink yourself under its briny ripples. That inviolate floatation is a blessing. Heaven forbid you should sink and get any of smelly water in your mouth or eyes. If you don’t shower as soon as you leave the water, visible salt crystals begin to bristle on your skin like white diamonds. 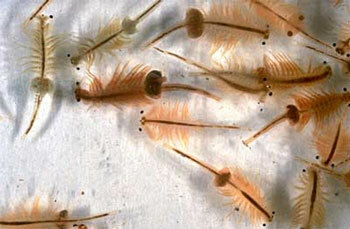 Another strange delight is watching brine shrimp drift around your body like tiny red-orange fish. When sold as pets, they’re called sea monkeys because of their long tails, but they overwhelmingly resemble shrimp, with a multitude of legs and small beady black eyes. Growing to the size of a large ant, they are some of the toughest creatures on the planet, least of all because they live in such saline waters. Their real toughness comes out when things get cold, dry, anoxic, or all of the above. During spring and summer brine shrimp are born live, but the young meant to float through the frigid waters during fall and winter are born as eggs called cysts. Space is also no match for the cysts. They spent 9 days there during an experiment before returning to earth and hatching with no ill effects. This amazing ability has made the shrimp into pets. Developers bred a type of brine shrimp that was likely to survive in a tank and the solution to keep them alive. They harvested the hardy cysts, dried them, and put them into the hands of curious buyers. Friends of mine fondly remember dumping powder into a small tank, letting it dissolve in regular tap water and just 24 hours later, having a tank of small pets. Beyond being pets for future biologists, why are brine shrimp important? They, along with water bears and a handful of other creatures demonstrate states of cryptobiosis (hidden life). Entomologist David Keilin defined cryptobiosis as “the state of an organism when it shows no visible signs of life and when its metabolic activity becomes hardly measurable, or comes reversibly to a standstill.” In the future, studies of this humble organism could even give us insight into what it might take for people to persist in a cryptbiotic state for the decades it will take to travel to some of the places we’d like to explore in space. The problems lie in translating biological processes that work in small organisms to large complicated organisms like ourselves. Only a few mammals, like bears and arctic ground squirrels, display metabolic adaptions to survive extremes. Do you think we’ll unlock faster-than-the-speed-of-light travel, or are we more likely to alter our own biological systems to make space travel possible? Is either option viable? It might serve me in the creation of my own novel about people who drop into a cryptobiotic state in order to rejuvenate, so I’ll keep following this line of research. Also, it’s as fascinating as a watching a tank of sea monkeys. ← Results-Would You Share Immortality?